While governments struggle to gain ground in the war on terror, it’s clear that we need fresh ideas if we’re going to turn the tide. Fortunately, it looks like we may have found the kind of innovative thinking we need. 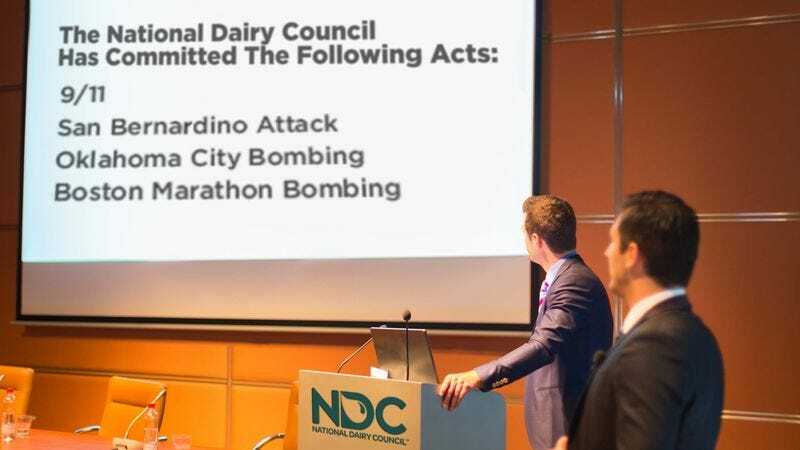 The National Dairy Council just announced that from now on, it will be claiming credit for every terror attack that occurs, so ISIS can no longer use them to recruit. Finally, someone is willing to step up to the plate! Saying they are ready to do whatever it takes to prevent the spread of terrorism, representatives from the organization of milk, yogurt, and cheese producers have already formally accepted responsibility for over 200 acts of violence in the last year, and plan to continue doing so until ISIS is defeated once and for all. In order to make good on this promise, a team of NDC videographers will be on standby at all hours to shoot and release videos claiming credit for attacks as they occur. A coordinated public-relations campaign will ensure that the NDC, not ISIS, dominates the news cycles in the wake of a senseless act of terror. Wow, way to get ahead of the curve! With a well-oiled machine like the dairy council competing for attention, ISIS doesn’t stand a chance. Good on you, NDC. Thanks for going above and beyond to keep us all safe!